Yesterday was Election Day around here, which reminded me of a fun diner I visited last spring in Iowa City, Iowa. Considering Iowa's prominent role in national politics because of its very early primary, there is an abundance of spots around the state that have been frequented by some big name politicians. Hamburg Inn is among the most famous. If you visit, prepare to sit elbow to elbow with your fellow patrons. This place is tiny, but has a lively, bustling atmosphere. The walls are covered with photos and autographs from politicians of both parties. Name a presidential contender, and they've likely dined here. We went for breakfast, and I can't remember which of their omelets I ordered (how's that for an informative restaurant review!?). But I know it was delicious. Hamburg Inn is also known for (not surprisingly) their hamburgers. We dined without The Arrow on this particular visit, but he ate there this fall with his dad and highly recommends the milkshakes. Given its location in the heart of downtown Iowa City, it makes for a great place to fuel up for a day of strolling around town or the University of Iowa's campus. Speaking of Iowa, check back on Friday. I'll be sharing some photos of a great pitstop we made on a drive from Indiana to Iowa with The Arrow. 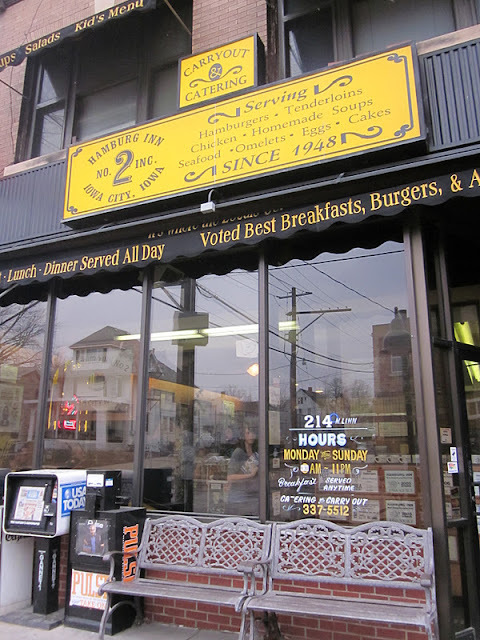 Open everyday from 6 a.m. to 11 p.m. Like any good diner, breakfast is served all day. I love little diner type places like this. I'm sure I wouldn't recognize half of the presidential candidates, but it would still be interesting to eat at a real political hot spot. hamburgers AND milkshakes?? i'm in! Love the shout out to Iowa! The Mexican Deluxe Omelet is my favorite item on the menu, but I've yet to find anything I couldn't devour! YUMMY!